a tissue sealant to complement sutures. Wounds can be closed by a variety of methods, and although the skill and technique of the surgeon is important, so is the choice of wound closure materials. The purpose of these materials is to create an optimal setting for wound healing, and maintain wound closure until it is strong enough to withstand daily tensile forces. However, in organs such as the heart, current technologies have significant drawbacks due to the high-stress environment with constant movement of muscles and flow of blood. The Paris-based startup Gecko Biomedical is dedicated to the development and commercialization of innovative wound closure solutions. They are developing a high-viscosity polymer, like a surgical glue, that becomes an elastic, biodegradable film once activated by UV-light. Over time, the glue safely degrades while the body’s own tissue grows in its place, creating a permanent, natural fix. Currently, they are developing two products called GB-02 and GB-04. GB-02 is a tissue sealant that can complement sutures specifically targeting cardiovascular reconstruction, while GB-04 is a patch with glue for sutureless closure that can be used for example in children born with defects such as a hole in the heart. The hydrophobicity and on-demand curing allow the technology to be delivered through minimally invasive procedures to challenging wet environments with no requirement of tissue drying prior to application. This is key advantages over current technologies that are hydrophilic and easily washed out before properly curing due to the dynamic and water repellent conditions inside the body. The innovative adhesive platform address all of the drawbacks of previous systems and provide physicians with a completely new, much simpler technology to improve quality of life of patients following surgical procedures. The adhesives maintain a very strong sticking power in the presence of blood, and patches attached to the walls of a beating heart remained despite the high pressure of blood flowing through the heart and blood vessels. 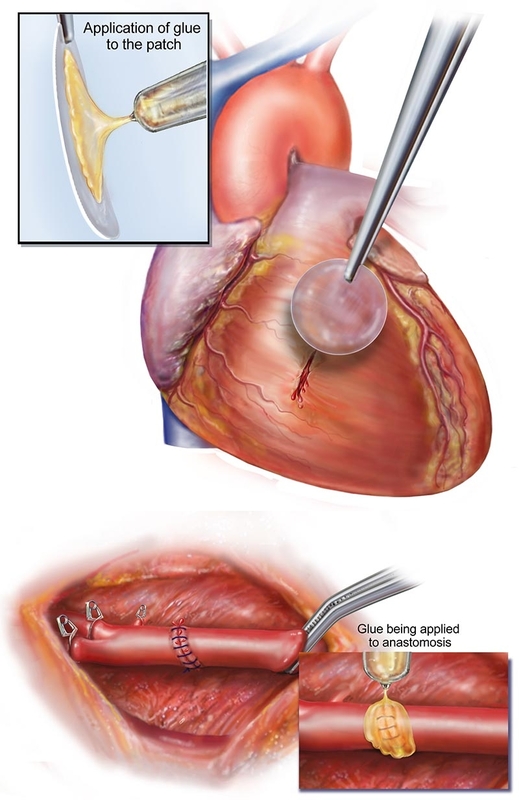 And since the adhesive can be applied with a syringe, many open-heart procedures could become minimally invasive, cutting down the risk of infection and radically reducing recovery times. The potential of the technology, and Gecko, is endless. They are working to expand their platform to additional applications in tissue reconstruction, and create an entire product portfolio based on the novel polymer that enables guided tissue repair. The startup was founded in 2013 by Christophe Bancel and Bernard Gilly from the iBionext Network, Jeff Karp from Harvard Medical School, and Bob Langer from MIT. One of their lead inventors, and current Head of Research at Gecko, Maria Pereira, was named a Forbes 2015 “30 under 30” in healthcare, a list of scientists under 30 who are changing the world. Gecko Biomedical recently raised $25.5 million, following a $10.8 million Series A in December 2013. The round was led by the prominent European venture firm Sofinnova Partners and investment bank Bpifrance, as well as existing investors Omnes Capital, CM-CIC Innovation and CapDecisif Management. The funds will be used to complete clinical plans in cardiovascular surgery, and seek regulatory approval.